Anyone have opinions on 1911 with 5 or 6 inch barrel? They both shoot great. If you like the 6 inch better go for it. 5" is capable of plenty of accuracy, and have more options for different aftermarket barrels. The 5" is lighter and usually cheaper. I don't believe either one has a functional or accuracy advantage over the other. You will have to choose for other factors. You could also install a 6" barrel in a 5" gun. I always thought a 5" slide with a 6" barrel and extended front sight was the coolest looking bullseye gun. A 5 inch is easier to shoot better scores with. A 6'' allows for more time the bullet is in the barrel which allows more time for the shooter to screw up the shot by movement. Personally I like 7 inch barrel for the 1911-45. Anything to get me closer to the target! A high master in my area still shoots HM scores with his 5" slide 1911 but a 6" barrel sticking out of it. Also he has as 6" bomar sight that juts over the end of the slide as well. When asked about it, he said there isn't much difference and searching for the 6" parts probably is not worth the time and money. IMHO, the 6" bomar rib with the extra inch of sight radius probably accounts for the extra bit of precision, and not the barrel. DavidR wrote: A 5 inch is easier to shoot better scores with. A 6'' allows for more time the bullet is in the barrel which allows more time for the shooter to screw up the shot by movement. I have a Clark long slide (6") and a Range officer (5"). Both guns are perfectly capable of shooting Master scores as I have done it many times. I do shoot a few points higher with the Clark but don't attribute that to the longer barrel, rather, it has more to do with everything else with the gun (better barrel, tighter bushing, slightly better trigger, better red dot, etc.). I also have a model 41 (7") and a Marvel (5"). 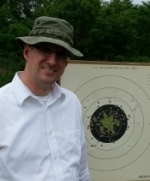 I shoot a few points better with the 41, but I have shot Master scores with both guns many times. The 41 has a better feeling trigger, but it is not as comfortable in my hand as the marvel. The 41 also has a better red dot than my marvel. Just looking at the scores, I would say that the guns with the longer barrels allow me to shoot better - I would say about 3 points better on a NMC. But that is not the whole story either. I have tens of thousands of rounds through my "long barrel" guns whereas I only have about a 1000 rounds through the short barrel guns. I have no doubt in my mind that I can shoot just as well with the short barrel guns as the long ones, I just need a bit more trigger time on them. As is always the case in this sport, it all comes down to trigger control. Thanks for all the feedback, it's great to be able to ask a question and get good responses.